The Creative Spark: Igniting the Creative Fire That Lives Within Us All: In her magnificent keynote, Heward takes you behind the scenes of Cirque du Soleil to explore the nature of creativity and innovation. A gifted storyteller, she dispenses practical advice on a range of issues: risk-taking; leadership; teamwork; product development; finding and developing talent; and fostering a dynamic corporate culture. With authority, Heward helps you find the creative spark and zeal for innovation that, in today’s business climate, can mean the difference between success and failure. The Landscape of Human Systems: In presenting a survey of his work, whether as large-scale colour photographs or more recently in film production, Burtynsky discusses the intersection of his image-making process as an artist while exploring modern civilizations’s troubling relationship with nature. 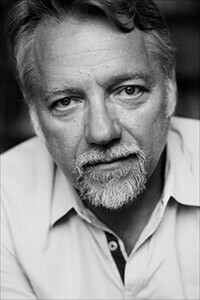 Biography: Edward Burtynsky is known as one of Canada’s most respected photographers. His remarkable photographic depictions of global industrial landscapes are included in the collections of over 60 major museums around the world, including the National Gallery of Canada, the Museum of Modern Art and the Guggenheim Museum in New York, the Reina Sofia Museum, Madrid, and the Los Angeles County Museum of Art in California. His imagery explores the intricate link between industry and nature, combining the raw elements of mining, quarrying, manufacturing, shipping, oil production and recycling into eloquent, highly expressive visions that find beauty and humanity in the most unlikely of places. In 1985, Burtynsky also founded Toronto Image Works, a darkroom rental facility, custom photo laboratory, digital imaging and new media computer-training centre catering to all levels of Toronto’s art community. Mr. Burtynsky also sits on the board of directors for: Toronto’s international photography festival, Contact and The Ryerson Gallery and Research Center. Exhibitions include Water (2013) at the New Orleans Museum of Art & Contemporary Art Center, New Orleans, Louisiana (international touring exhibition), Oil (2009) at the Corcoran Gallery of Art in Washington D.C. (five-year international touring show), Manufactured Landscapes at the National Gallery of Canada (touring from 2003 – 2005), Before the Flood (2003), and China (toured 2005 – 2008). Burtynsky’s visually compelling works are currently being exhibited in solo and group exhibitions across Canada, in the United States, Europe and Asia. Mr. Burtynsky’s distinctions include the TED Prize, The Outreach award at the Rencontres d’Arles, The Flying Elephant Fellowship, Applied Arts Magazine book award(s), and the Roloff Beny Book award. 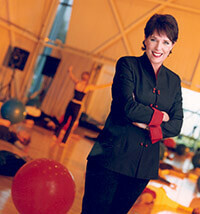 In 2006 he was awarded the title of Officer of the Order of Canada and holds six honorary doctorate degrees. The Sky Is Not The Limit: In his passionate and illuminating talks, Hadfield imparts the useful and practical lessons he’s learned throughout his remarkable career in the fields of leadership, teamwork, collaboration, science and technology, and motivates audiences to achieve dreams higher than the clouds. Biography: “Good morning, Earth!” That is how Colonel Chris Hadfield–writing on Twitter–woke up the world every day while living for five months aboard the International Space Station. Through his 21-years as an astronaut and three spaceflights, Colonel Hadfield has become a worldwide sensation, harnessing the power of social media to make outer space accessible to millions and infusing a sense of wonder into our collective consciousness not felt since humanity first walked on the Moon. Called “the most famous astronaut since Neil Armstrong,” Colonel Hadfield continues to bring the marvels of science and space travel to everyone he encounters. Colonel Hadfield is a pioneer of many historic “firsts”. In 1992 he was selected by the Canadian Space Agency as a NASA Mission Specialist–Canada’s first fully-qualified Space Shuttle crew member. Three years later, aboard Shuttle Atlantis, he was the first Canadian to operate the Canadarm in space, and the first Canadian to board a Russian spacecraft as he helped build space station “Mir.” In 2001, aboard Shuttle Endeavour, Colonel Hadfield performed two spacewalks–the first Canadian to do so–and in 2013, he was Commander of the International Space Station–the first and only Canadian to ever command a spaceship, so far. 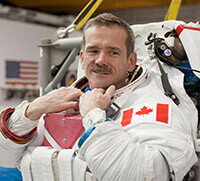 A heavily decorated astronaut, engineer, and pilot, Colonel Hadfield’s many awards include receiving the Order of Canada, the Meritorious Service Cross, and the NASA Exceptional Service Medal. He was named the Top Test Pilot in both the US Air Force and the US Navy, and has been inducted into Canada’s Aviation Hall of Fame. He is the author of the internationally bestselling book An Astronaut’s Guide to Life on Earth, and has been commemorated on Canadian postage stamps, Royal Canadian Mint silver and gold coins, and on Canada’s newest five dollar bill (along with fellow astronauts Steve MacLean and Dave Williams). Subject: Expedition 35 (Soyuz 33S) crew members Tom Marshburn and Chris Hadfield during EVA training at the NBL.